Born in July 1958, Watterson created his iconic and much-awarded cartoon strip Calvin and Hobbes after first trying his hand at political cartooning, developing an interest in lampooning the political arena while majoring in Political Science at Kenyon College in Ohio. Calvin & Hobbes incorporates elements of Watterson's life: his interests, beliefs, values and memories of his father's speeches about "building character." For his efforts, especially creating those thoughtful and provocative statements, he was awarded nearly every major cartooning prize. 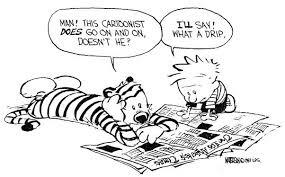 In his much-lauded book, The Complete Calvin And Hobbes, Watterson said the precocious Calvin is named for the 16th-century theologian who believed in predestination, while Hobbes is named for "a 17th-century philosopher with a dim view of human nature." Regardless, his words and images, delivered from a wise little boy and his talking stuffed tiger, stand the test of time – something every writer and artist hopes his or her work will achieve.